If there ever was a time for Airing of the Grievances, it's now. More from our friend Leslie Eastman at Legal Insurrection. 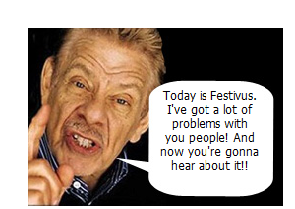 Please, no airing of grievances today. I'm smoking a rack of ribs, the Saints beat the Cowgirls and Newcastle won a crucial game against QPR yesterday. Life is good. I hope it is for you, too, amigo.